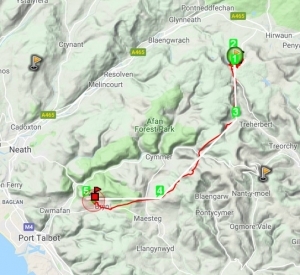 From the A465 (Heads of the Valleys Road) take the A4061, signposted to Treherbert/Rhigos. Alternatively take the A4061 from Rhondda. Park in the viewpoint car park. The Rhigos site is actually Mynydd Beili-glas which has spectacular view to the north over the Brecon Beacons – Pen Y Fan is often easily identified on the horizon. Take-off is located in the field below the car park. Access to the field is by way of a gate 50mtrs to the east of the car park. No other areas should be used due to the hazards of the road, car park and vehicles. 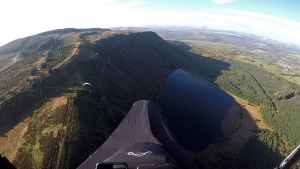 Rhigos take-off viewed from a paraglider. Photo courtesy of Lee Thomas. Top landing is to the east of the steeper take off site. 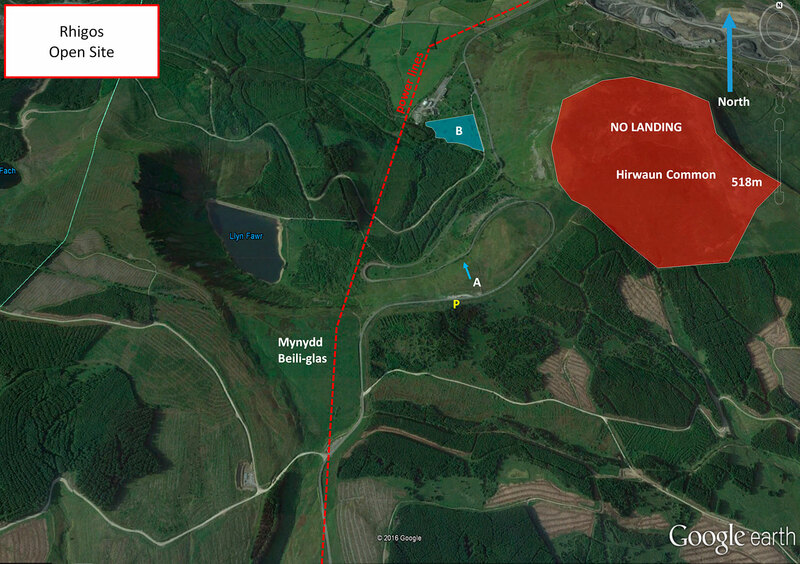 Do not land on Hirwaun Common which is NE of the car park/viewpoint as access has not been agreed (Hirwaun Common is a historical paragliding training site). Bottom landing is possible in the rough field adjacent to Tower Colliery. The grass is very long, the field is boggy and it has a raised dirt track going through the middle. A preflight inspection is advised. An aerial view looking down on the take-off. Photo courtesy of Tim Pentreath. Looking back at the Rhigos site. A view across to Hirwaun Common (a former paragliding training site) is visible on the left. Photo courtesy of Tim Pentreath. A very scenic site situated on a main road. Any flying usually attracts a crowd. A committed take off is required and care needed until sufficient ground clearance is gained. Flying from Mynydd Beili-glas (Rhigos) looking west. Llyn Fawr (“Great Lake”) is visible at the bottom. Photo courtesy of Lee Thomas. 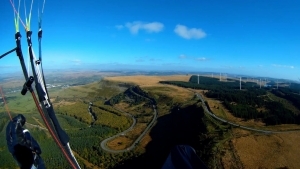 Rhigos is complex site to fly and so it is pilot rated. In particular there is wind farm directly behind take-off. If you are not sure that you can clearly stay away from the wind farm then do not fly. The take-off/ top landing field is extremely undulating and boggy underfoot, with long grass which can easily mask the terrain below this can hinder safe take-off and landing. Several large white/yellow posts and barbed wire fences surround the take-off. Be aware of these when launching. The whole area is populated with large trees and rocky/craggy outcrops, this can cause turbulence and a snag hazard if flown in close proximity. The main road can be extremely busy with cars and large HGVs. It is strongly advised that the road behind launch is not over flown. Do not attempt top landing in the car park. A power line to the left of take- off runs from the top of the hill to the forest below at approximately 45° to the hill, it is easily hidden and pilots should ensure they familiarise themselves with its location before taking off. The fence to the take-off usually has a gate, this was not present at time of writing, however if present should be closed after access. This site is flown with the kind permission of Mr Mervyn Morgan. This site is not commonly used for XC although flights to the coast and Cardiff (for the Capital trophy) are possible. 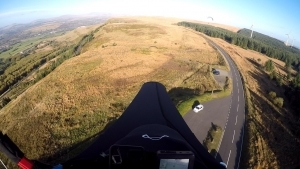 PG – Lee Brogan flew 16.5 km on his Cayenne 5 to Bryn Rugby club on 04 August 2018. 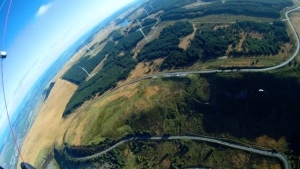 Rhigos mountain pass on the S bend of the A4061 located 4.5km SW of Hirwaun on the A465.